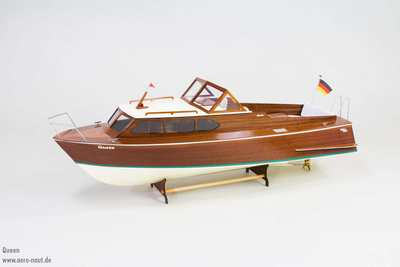 Queen is a semi-scale wooden boat from the 1960?s. During this period sports boats were still built from durable mahogany timber - as is our Queen. We have again adopted the proven hull design of our two models Classic Sportboat and Diva, but with increased size and a new superstructure. The side panels of this model?s superstructure are glued permanently to the hull in order to provide effective protection from spray. Access to the interior is gained by raising the cabin roof and lifting out the cockpit as a complete shell from the rear part of the hull. This model is an all-wood kit based on a hard-chine hull, which is a basic requirement for fast, straightforward building. All the wooden parts are highly pre-fabricated, and are ready to be glued in place after a quick check for fit. The basic method of assembly is the same as that of the Classic Sportboat and Diva: the hull is built over a die-cut Depron sheet jig into which the bulkheads are inserted. Fitting the keel and the two fore-and-aft bearers completes the basic bulkhead framework. The ideal power plants for the model are the Race / Speed 600 - 700 series of electric motors. Powered by ShopFactory to sell P2234 online. All-in one eCommerce and online shopping cart software.